Whether you're looking for a Birthday Party, Halloween Party, Winter Holiday Party, Valentine's Day Party, a School's Out Party, or any Special Occasion Party, Mad Science parties entertain children of all ages with exciting, high-energy, interactive shows that come to you. See paper disappear in a flash! Now featuring Mad About Magic! What’s the difference between science and magic? That’s one of the many things kids will discover while having a blast, learning the science behind magic tricks! Meet Ralph, the Mad Science stuffed pet lab rat, who appears and disappears, discover the physics that makes a pipe sing, learn about the chemistry that makes memory wire work, and watch as invisible air pressure causes objects to implode or float. An hour magically disappears as the Mad Scientist performs 7 to 10 experiments in this fun-packed party! Also, kids get to make their own science project to take home and the Birthday Child receives a Mad Science Kids’ Lab Coat. Make it extra special with Goody Bags, Invitations, and Finales! 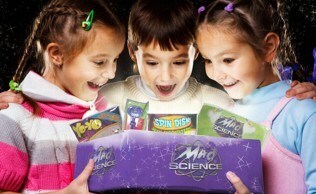 You can even add Mad Science Kids’ Lab Coats for everyone! 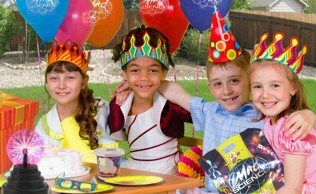 If you've already seen Mad About Magic, please mention it when ordering, so that a Mad Science party advisor can suggest a different party.